Home /Blog/How Much Does Your State Collect in Excise Taxes Per Capita? While income and consumption taxes are levied on a general base, an excise tax is a tax on a specific good or activity. You’ll typically see excise taxes on things like cigarettes, alcoholic beverages, soda, gasoline, insurance premiums, amusement activities, and pari-mutuels (betting), among other goods and activities. Excise taxes make up a relatively small portion of state and local tax collections—only about 11 percent—but per capita collections vary widely from state to state. Vermont has the highest state and local excise tax collections per capita ($1,075), followed by Nevada ($993) and Hawaii ($928). 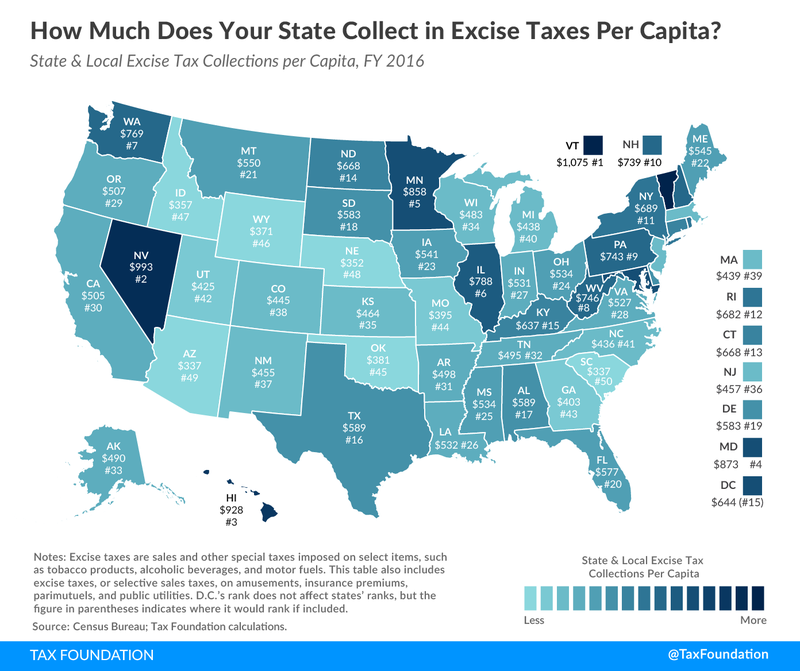 South Carolina and Arizona collect the least in state and local excise taxes per capita ($336.51 and $337.29, respectively), followed by Nebraska ($352) and Idaho ($357). In the past, state and local taxing authorities have turned to excise taxes as a way to generate revenue quickly. To increase the chances that these taxes can get approved, many proposed excise taxes come in the form of “sin” taxes on specified activities (such as smoking or drinking or gambling), so advocates can make a case around the health benefits that result when higher prices lead to reduced consumption. However, since reduced consumption naturally leads to a decline in tax revenue, the goals of raising revenue while reducing consumption are contradictory. Beyond this, excise taxes are subject to several notable limitations. Soda taxes have unintended consequences that make any impact on obesity negligible at best. Cigarette taxes are an unstable source of revenue. Excise taxes are levied on a relatively narrow tax base, and many are regressive, with a larger share of the tax burden falling on those with lower incomes. Keep an eye out for our upcoming maps to see how much your state collects in specific excise taxes. If you can’t wait that long, check out last year’s maps, which show state-by-state excise tax rates on cigarettes, e-cigarettes and vapor products, beer, spirits, and marijuana. You can find the most recent data on these and other excise taxes, including gasoline, wine, cell phone, and candy and soda taxes, in the excise tax section of Facts and Figures.